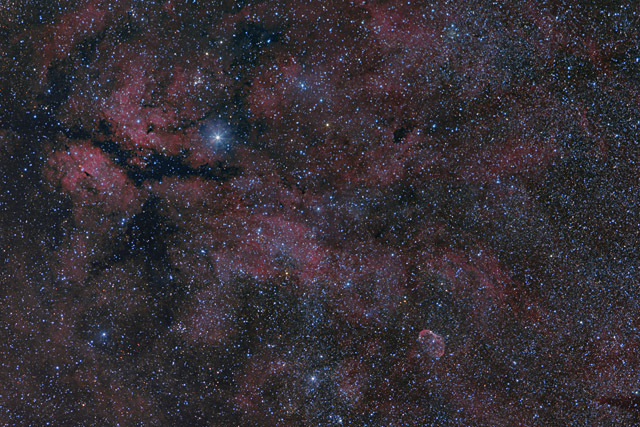 Gamma Cygni (Sadr) is a bright star in the constellation of Cygnus that appears to be surrounded by extended nebulosity. However, Sadr is actually a foreground star superimposed upon the background nebula. The nebula, also known as the Butterfly Nebula, is catalogued as IC 1318 and is over 100 light years across. The nebula is bisected by a foreground dark lane called LDN 889. In the lower right corner of the image is NGC 6888, the Crescent Nebula. In this image, North is up. The image is cropped to 90% of the original full frame. Software Used Images Plus 5.75 for camera control, calibration, stacking, digital development, feature mask, smoothing and noise reduction, and multiresolution sharpening. Photoshop CS5 used for levels and curves, high pass filter, screen mask invert, vibrance, match color, selective color, lab color, and unsharp mask. Gradient Xterminator for gradient removal. Registar for stack alignment and registration. Notes I have mixed emotions about this image. I've never been very fond of the area around Sadr, as the nebula has no definable structure and I've always felt its kind of ugly. I'm overall happy with the look of this image, especially the Crescent nebula. Nonetheless, I still remain underimpressed with this field of view.